On lack of space…. | Use. The. Clutch. I’m a runner. I have no problem saying that. I’ve been seriously running since 2012 and I think the first time I actually called myself a “runner” was sometime during the summer of that year. Probably when I cleared six miles for the first time. In fact, I know that’s when it was. It was when I cleared six miles and thought, “Meh, it’s only six miles.” WHAT?! Six miles is a really long way to run! 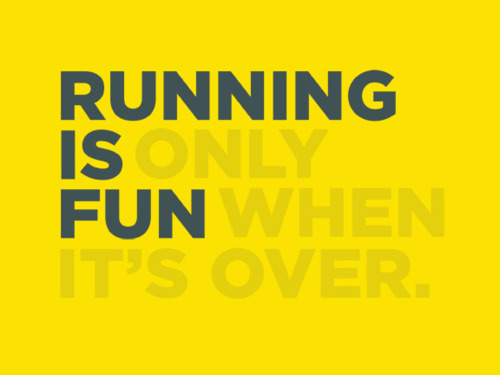 There is no “only” when it comes to running. But ever since I jumped back on the running wagon after giving birth, it just hasn’t been the same. I don’t enjoy it the way I used to. I don’t relish the idea of getting out and pounding pavement for an hour. I can barely slog through two miles anymore. I think the furthest I’ve run in the last several months in three miles. And I don’t think I can safely use the “I just had a baby” excuse anymore…it’s been over seven months. Every time I get out to run, I do it out of obligation. I have a half marathon in September and I don’t want to have a crappy pace. I want to at least finish in 2:30, which is totally manageable. That’s almost a 12-minute-mile and I’m currently training at an 11-ish-minute. I don’t enjoy running anymore. But I’m also not exactly ready to give it up. It’s the easiest and cheapest form of total body exercise. I can do it year-round. I (used to) enjoy running in the snow and the rain, so weather is rarely a concern. I’ve invested hundreds and hundreds of dollars into the sport. I’ve never considered myself an athlete until I started running and I don’t want to give up that status. I have a special friend that I run in honor of and have been running for, for almost three years. I’m completely unbalanced in the tattoo department and can’t get my other foot done until I’ve completed a full marathon (that’s the deal I’ve made with myself). My mother – who is nearly 60 – is running a 9-minute-mile and goes out for at least 5 miles every single day (she is as badass as she sounds) and I’ve never wanted to be more like her than I do now. For me, running has been and always will be a solo sport. I’ve been running alone since the second I started doing it. I’ve always trained alone. It was something I had to do for me. I’m quite terrible at being alone, if I’m honest. And this was something I needed to do for me. Just for me and no one else. I can probably count on two hands the times I’ve run or trained with someone. Even when I race with someone, what I really mean is, “Let’s run the same race on the same day and meet at the end for a beer.” I’ve only ever run one race truly with someone (and yes, I loved it. She was my support crew and I’m forever grateful to her for that). Honestly, I’d love to run my first full with my best friend. She’d be an incredible coach and would probably save me from jumping off the course (or a bridge). All other races though…those have to be solo. But now, I’ve got this tiny, adorable, squishy little human that seems to need to tag along with every single thing I do. Pushing the stroller is insanely difficult and despite telling myself “It’s weight training” or “It’ll just make my pace that much better”, I still hate doing it. I feel bad when I don’t talk to her the entire time we’re running. I feel bad when I know it’s getting too toasty for us, but I really need to pound out that last half mile. And there just isn’t enough room in my life to feel emotionally crappy while I’m feeling physically crappy. In fact, there’s not enough room in my life to feel emotionally crappy at any time. Running is where I learned to be solo again. Running taught me about autonomy. Running helped solidify and define who I am as an individual. So maybe I’m not ready to give it up. But scaling back is on my horizon. At least until I can truly do this on my own again. ← On getting it together….